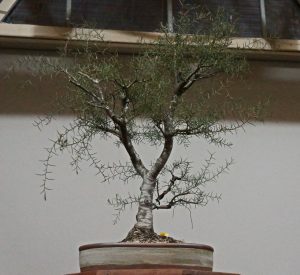 As promised, this meeting presented the first in a proposed irregular series of reviews of some of the native species suitable for Bonsai found in particular regions across Australia. 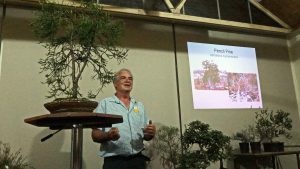 This first program of the series was a presentation on a number of species found in Tasmania, both endemic to Tassie and found in other areas as well, with which VNBC members have some experience (or hope) in developing as bonsai. 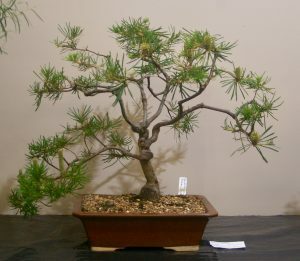 The presentation featured pictures of the various species as found in the wild or in cultivation, and as bonsai either in early stages of development or as established bonsai specimens. 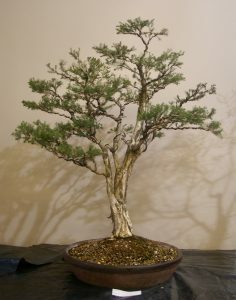 A number of the tree species discussed were brought in by the various members who are working on them. After a broad review of the landscape and ecosystems of Tasmania, the species presented in the discussion included a number from quite a range of landscapes. From the alpine and sub-alpine areas and associated forests, we saw such species as Pencil Pine (Athrotaxis cuppressoides), Mountain Plum Pine (Podocarpus lawrencei), King Billy Pine (Athrotaxis selaginoides), Celery Top Pine (Phyllocladus asplenifolius), Huon Pine (Lagarostrobus franklinii), Strawberry Pine (Microcachrys tetragona), Varnished Gum (Eucalyptus vernicosa), Alpine Ash (Eucalyptus delegatensis), Alpine Baeckea (Baeckea gunniana), Alpine Tea Tree (Leptospermum rupestre), and Myrtle Beech (Nothofagus cunninghamii, or is it now Lophozonia cunninghamii?). Other species discussed from across the landscapes of Tasmania included Swamp Paperbark (Melaleuca ericifolia), Green Bottlebrush (Callistemon viridiflorus, or now Melaleuca virens), Sallow Wattle (Acacia mucronata), Woolly Tea Tree (Leptospermum lanigerum), Tea Tree “Rocky Rambler” (Leptospermum scoparium var. ), White Peppermint (Eucalyptus pulchella), Blackwood Wattle (Acacia melanoxylon), Midlands Wattle (Acacia axillaris), Cape Pillar Sheoak (Allocasuarina crassa), and Necklace Sheoak (Allocasuarina monilifera). 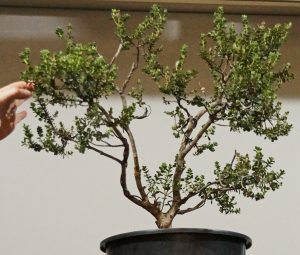 Many of these species present their own particular challenges in developing as bonsai, but there are some outstanding possibilities amongst them as well. 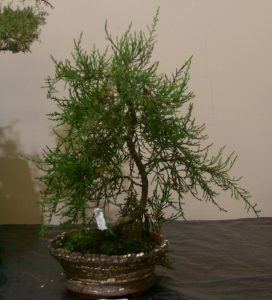 The examples brought in by some of the presenters showed that there is quality bonsai stock amongst the species of Tasmania. And this was not an exhaustive review by any means, as we know that there is plenty of development work going on in Tasmanian bonsai circles! However, it was a great overview, and a good introduction for many members to some of the trees which they had not met previously. It will continue to be interesting to see some of these develop further over time. 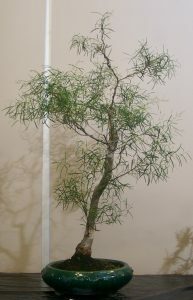 Some of the trees on the display table at the meeting included the following.